I understand there are a lot of mixed feelings out there about reviewing a restaurant on opening night. Let’s, then, consider this a “set of paragraphs with some helpful recommendations” written by the designated vegan, shall we? After years of waiting, I finally had the opportunity to dine at California Grill on the night of its grand re-opening. I was stoked. Having absolutely no point of reference for comparison, I was blown away by the atmosphere, the view, and the awesome window shades that automatically raised as the sun was setting in the distance. Before even having a taste of my pineapple juice, I made up my mind that I was going to love everything about the evening that followed. My dietary preferences had been noted in the reservation ahead of time, and confirmed again with the host a few hours prior to our reservation. 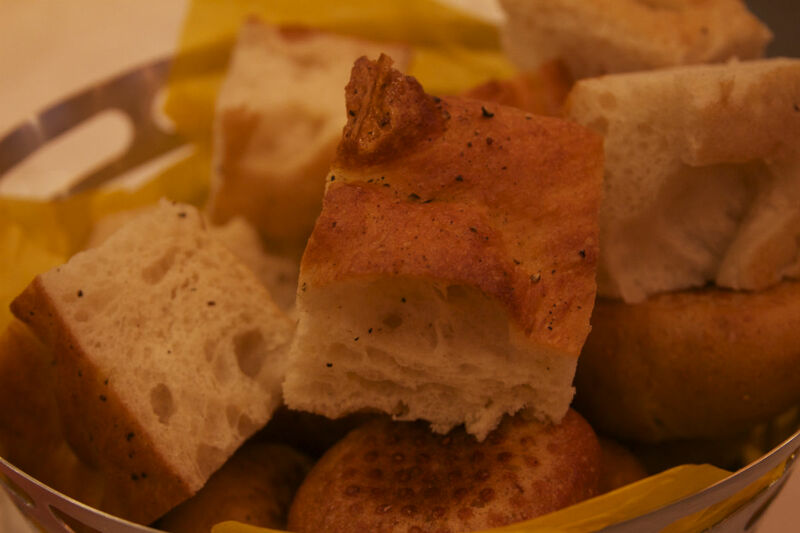 Upon being seated, our server confirmed to me that both types of bread – a lavender focaccia and whole wheat sourdough rolls – were both vegan. I was very surprised by this, since many restaurants in Walt Disney World use bread that contains eggs. I even asked twice, but was assured that both types of bread were vegan. Both options were delicious, I could have eaten the whole basket on my own. After quickly perusing the menu, I noticed there were no options that were vegan by default, but gave an extra glance to the Roasted Squash Ravioli, since it sounded delicious (Root spinach and parsnips? Don’t mind if I do, but I didn’t.). I was also really interested in the Carrot and Cilantro Soup, but unfortunately it was cream-based and contains halibut. Two strikes, soup! Our server, Abdou, coached me through the Soup, Salads, and Appetizers section of the menu. He recommended the “Romaine Salad,” to which I agreed. 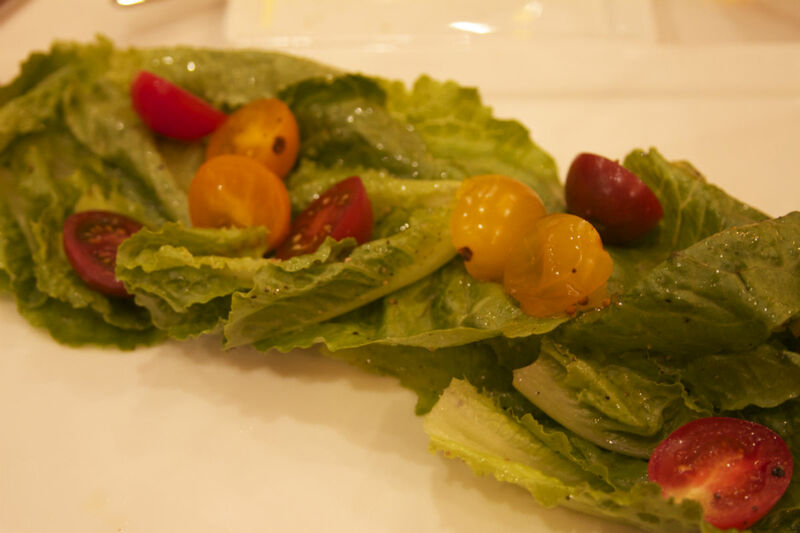 When it arrived, it was tomatoes atop leaves of Romaine lettuce seasoned with oil, a bit too much salt, and pepper. There wasn’t much to the dish, as you can see, I was underwhelmed yet hopeful for what was to come next. The rest of my party was then served a course of sushi. I was told there would be none coming out that was vegan. I, instead, enjoyed my unsweetened iced tea. Upon asking what my options might be for a main course, the server let me know he would speak with the chef, and they would “take care of me.” I don’t like to be demanding, or bothersome in general, and especially at restaurants, so I agreed to whatever surprise entree would be made for me. If you’re not accustomed to dining with dietary restrictions or ethical dietary preferences, it might sound strange to leave your entree choices in the hands of a stranger. This “let go and let chef” method, however, has happened to me quite frequently when dining at WDW restaurants. I can’t say I’m always a fan of having no idea what my entree will be, but I was up for it, in this case. When my entree arrived, the presentation was pretty. I was given four small plates as my main course. 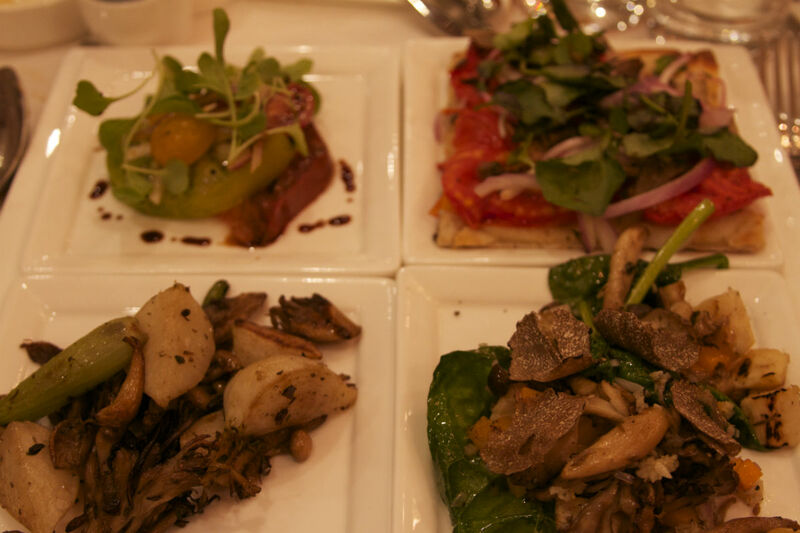 In a particular Vanessa Williams-style order of saving the best for last , the four plates included: a tomato salad with balsamic vinegar; an assortment of mushrooms, parsnips, and spinach; two slices of flatbread with tomato; and finally roasted potatoes, parsnips and mushrooms. All four dishes were good, and heavy on the mushrooms and parsnips, which was fine by me. I was glad at the inclusion of the slices of flatbread, as that was the most substantial part of the meal, and none of the other three dishes or my appetizer were particularly filling. Though this felt more like four appetizers instead of an entree, I did enjoy what was offered and appreciated the effort. 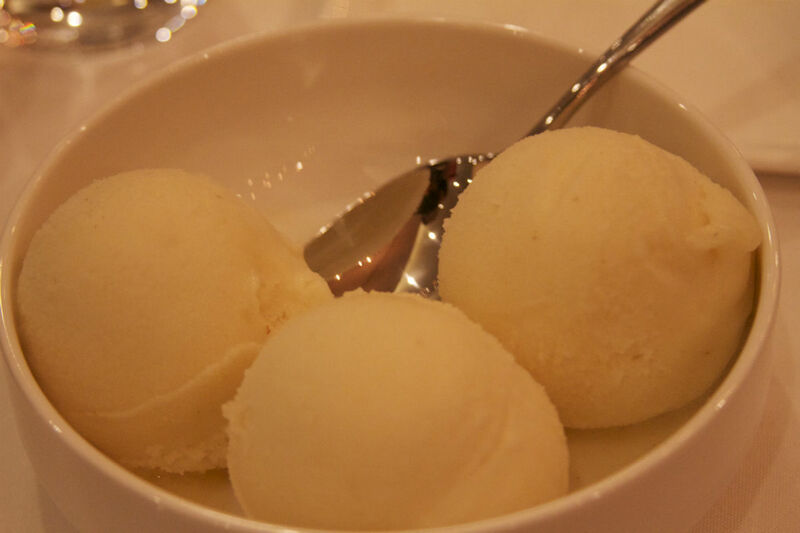 I finished off my meal with a surprise dessert of pear and ginger sorbet. The sorbet had a really strong ginger taste, which is not really my thing. It tasted like eating frozen ginger ale, so I passed it around the table for everyone else to enjoy, too. 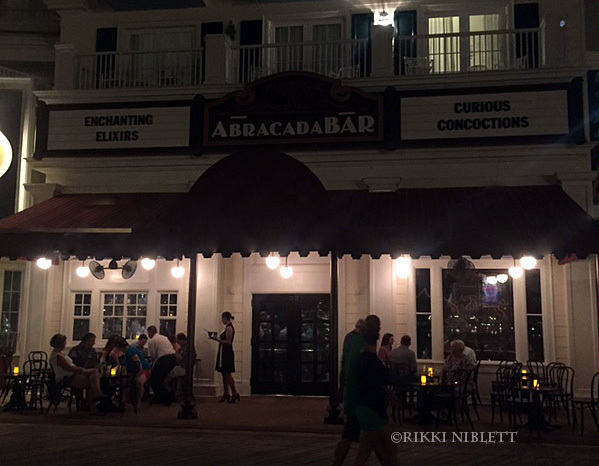 The pure fact that I was able to leave my table in between my appetizer and entree to go watch Illuminations in the distance, and leave once again in between my entree and dessert to watch Wishes, would have made me happy, even if I had been served cold sand. Luckily, my dinner was better than cold sand, but did not live up to all of the hype I have heard about California Grill for so long. For vegan dining specifically, there are a host of other WDW restaurants that have a lot more to offer. Dining here made me wish for a Citricos menu in a California Grill atmosphere. As you may have noticed, the menu was heavy on fall flavors: parsnips, carrots, ginger, et cetera. If I do return to California Grill, I would like to do so in the spring to see what different flavor profiles they have to offer in a new season. Emily, do you think the experience would have been better on a less chaotic night than opening? As one of the diners at CA Grill that night, I found the kitchen wasn’t executing anything, vegan or not, to the standard I expected. I would definitely like to give California Grill another chance, once things have calmed down. Being that it was a full house, and opening night, I imagine it was more hectic than it will be in the coming months. I’d also like to return and ask if they are able to make a vegan sushi option, I think that would be a great way to enjoy the atmosphere without spending quite so much money.